May 2016 – Concurrent Technologies announces a new processor XMC module based on a low power variant of the 6th generation Intel® Core™ family previously known as Skylake-H. Processor XMCs are a form of computer on module with a defined conduction-cooled envelope suitable for use on both custom and open standard based carriers, including VPX and VME. XP B5x/msd is intended for use in long life-cycle applications within the industrial, scientific, defence and aerospace markets, including environments needing rugged solutions. XP B5x/msd initially features the 2-core Intel® Core™ i3-6102E processor with 8GB of DDR4 ECC DRAM to provide good performance with low power consumption. It includes an on board 64GB solid state disk which can accommodate an Operating System, application code and data storage. Main connectivity to the baseboard is provided by a single x8 or dual x4 PCI Express® (PCIe®) lane configuration for high bandwidth connectivity. 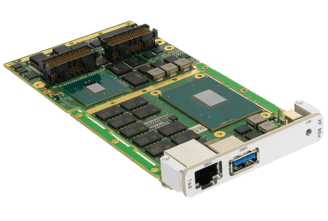 A range of standard I/O interfaces including Ethernet, USB, SATA, RS232, digital I/O and DisplayPort are included to satisfy a variety of configurations. 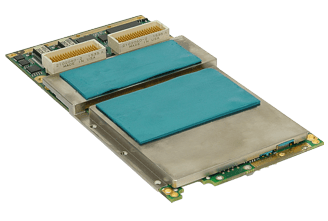 “Most of our products are based around the premise that the Intel® processor board is the centre of a solution that scales by adding more boards in a rack or slot type of environment. 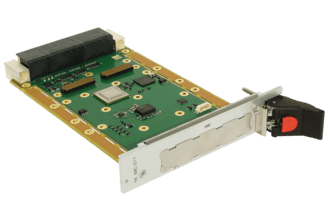 This XP B5x/msd module turns that concept around, allowing customers with a signal processing board to add an Intel® processor module for control, storage and display purposes. This makes it simple to create solutions for applications like image analysis and signals intelligence”. Air-cooled XP B5x/msd modules are available for immediate shipment and rugged conduction-cooled variants will follow later this year.